The OECD released their Revenue Statistics publication for 2015 this week, revealing the total tax revenue as a percent of GDP of the OECD countries has risen by 10 bases points. The increased tax revenue was driven by an increase in income tax collected in the largest OECD economies. Both Mexico and Turkey increased their tax revenues as a percent of GDP by more than 1 percentage point. Several Central European countries experienced significant increase in tax collections as well. 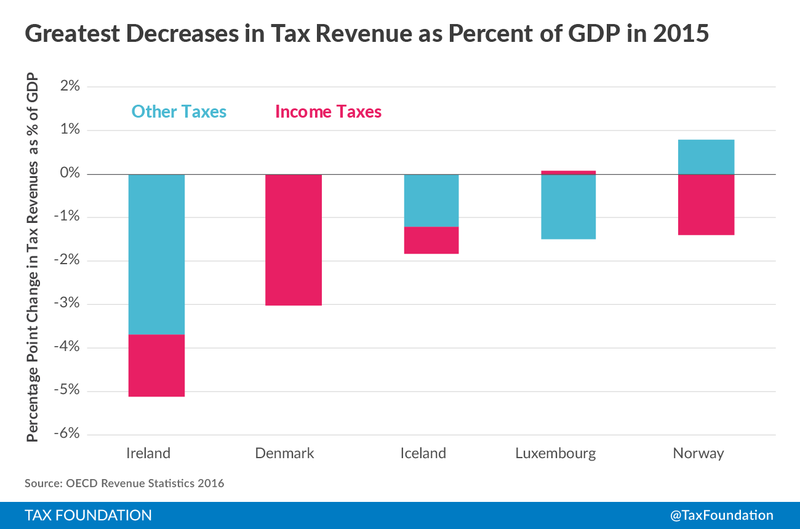 Several Northern European countries had a decline in tax revenues, including Ireland, Denmark, and Norway. Overall, the increase continues the trend of more tax revenue relative to economic output. The increase in tax revenues is part of a trend across the OECD. Since the beginning of the Great Recession, the OECD has increased tax revenues by 2 percentage points. Initially, these increases were from consumption taxes, such as the VAT. This last year, the increase was mostly driven by an increase in income taxes collected. This was partially driven by progressive income tax codes and an increase in incomes at the higher end of the distribution. Several countries had strong increases in tax revenue as a percent of their GDP. Mexico had the greatest increase of 2.2 percentage points. Half of that increase was from income taxes. Turkey’s tax revenues increased by 1.2 percentage points, driven by payroll taxes. 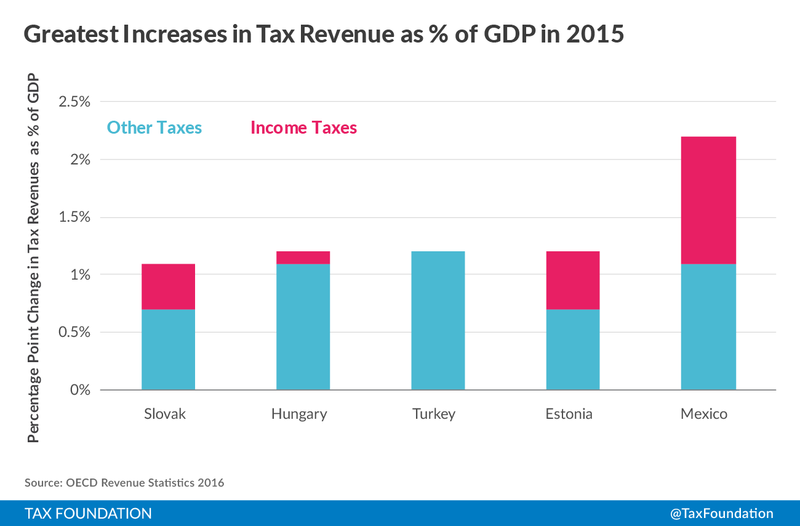 Estonia, Hungary, and the Slovak Republic also had more than a percentage point increase in tax collections. Income taxes and consumption taxes led the increase in tax revenues for these countries. Greece also had a 1 percentage point increase in tax revenue collected, but the increase was caused by a decrease in GDP while tax revenues in Euros remained constant. Some countries had a decline in revenues collected as a percent of GDP. Ireland had the greatest reduction of tax revenues, more than 5 percentage points. The fall in revenues as a percent of GDP was due to rapid growth in Ireland of 32.4 percent, largely caused by activity of multinational corporations, while tax revenues only increased slightly. Denmark and Norway each had more than a 1 percentage point decline in t collected. A fall in income tax collections is responsible for the decrease. Iceland also had a decrease in taxes collected, but a decrease in consumption taxes was the primary cause. Although the trend across the OECD is an increase in the portion of economic output collected as taxes, this trend could be caused by slowing growth in OECD countries. OECD economists expect GDP to grow at 1 to 2 percent for the foreseeable future. 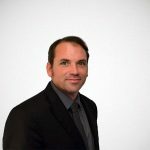 The slow growth combined with expanding government programs should continue to put upward pressure on the portion of economic output that is collected in taxes. These forces will ultimately cause countries to face one of two realities: find ways to increase economic growth or reduce government spending. It is possible that increasing growth in the future may require lowering the tax burden today, funded by reduced government spending. Unfortunately, the tradeoff is hard for many politicians to bear.